In an equal mixture of pagan ritual and Christian fervor the Ga tribe of Ghana buries their dead in a collection of intricately carved and painted coffins. The funerals are closely associated with ancestor worship and are important community events – taking place every Friday and Saturday. The express purpose of the handmade coffins is to glorify the dead by displaying the source of their success: Mercedes Benz’s, cocoa pods, animals, soccer balls and fish are all popular designs. This ancient tradition exists alongside modernity in Ghana and it is still popular for people to pick out their coffins before death. The funeral business is one of the most thriving industries in the country and for a member of the Ga tribe it is better to incur lifelong debts than to cut back on funeral expenses. Funeral processions are fashionable and lavish affairs - the ultimate manifestation of a deep-rooted tradition. Sadness and the outpouring of grief exist alongside celebration, drinking and dancing. The parties are fervently anticipated, promoted weeks in advance with online advertisements and extravagant obituary notices that often detail who the “chief mourners” are and credit the MC, technical staff and band for the event. A well-attended funeral carries great social prestige — and the bigger the party, the better. The funeral of George Dowuona (49) was no exception. A respected fisherman in his community – he was laid to rest in the large handcrafted wooden fish. The ceremony was a throbbing affair – complete with Ghanaian high-life music, much drinking and an equal measure of wailing. Several “chief mourners” carried the coffin through the streets of Teshie, stopping at several bars and homes associated with the deceased where generous libations were poured in his honor. 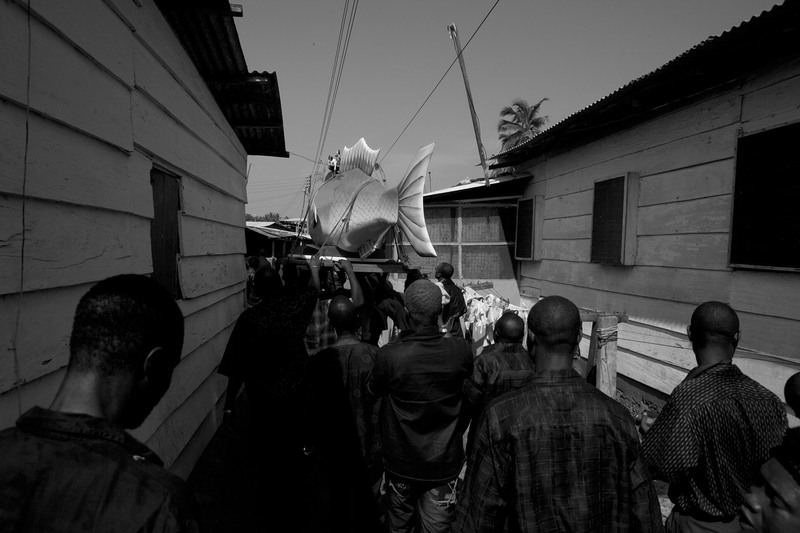 After several hours of walking the procession made its way to the cemetery where the fish was lowered into the ground.